The FMP10-40 series is comprised of two model types: The base instrument FMP10-20 and the flexible, user definable premium class FMP30-40 with up to 100 application settings. Automatic probe and base material recognition. Large graphics display in a ultra sturdy housing. Simple instrument operation and versatile evaluation capabilities. Now includes user friendly Data Center Software. The new FMP10-20 generation of proven portable instruments with wide assortment of plug-in type probes provides precise measurements. 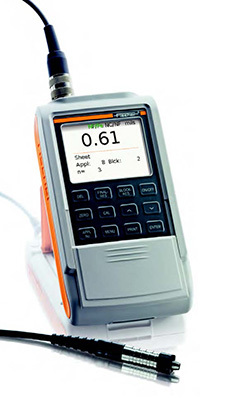 In addition to one user created calibration application, these easy to operate and sturdy instruments are suitable for virtually any coating thickness measurement requirement. The spectrum of requirements that the FMP10-20 is capable of spans from extensive painted specimens to other very specific and complex measuring challenges. Common characteristic statistical values are also determined and displayed for the measurements on the FMP10-20 Series. 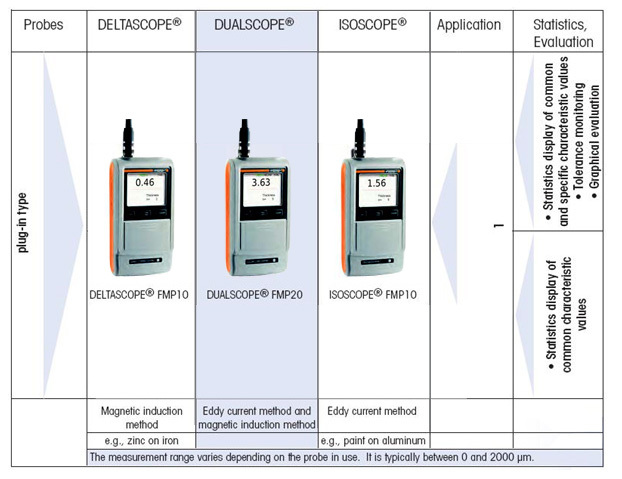 Depending on your measuring application, you can make precise coating thickness measurements according to the magnetic induction method (Deltascope® FMP10), the eddy current method (Isoscope® FMP10) or according to both methods combined in one instrument (Dualscope® FMP20). Used for the measurement of non-ferromagnetic metal coatings, e.g., chrome, copper, zinc, as well as paint, lacquer, enamel or plastic coatings on steel and iron. Used for the measurement of paint, lacquer or plastic coatings on non-ferromagnetic metal substrate materials; used for anodic coatings on aluminum as well as electrically conducting coatings on non-conductive materials. 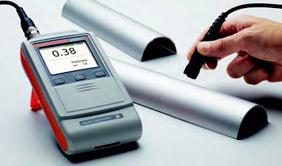 Due to automatic substrate material recognition and the combination of both measurement methods, this universal instrument is capable of measuring numerous coatings both on iron/steel and on non-ferromagnetic metals and on non-conductive materials. The new FMP30-40 series is even more versatile than the standard models FMP10-20. These instruments integrate additional features such as more memory for numerous applications as well as extensive statistical and graphical evaluations. Tolerance limits can be entered into the calibratable applications and the production process can be analyzed statistically. 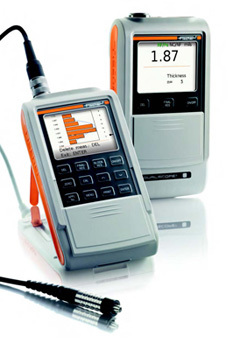 The default mode can be switched to matrix mode for connected multipoint measurements. These are only a few of the many features described below. 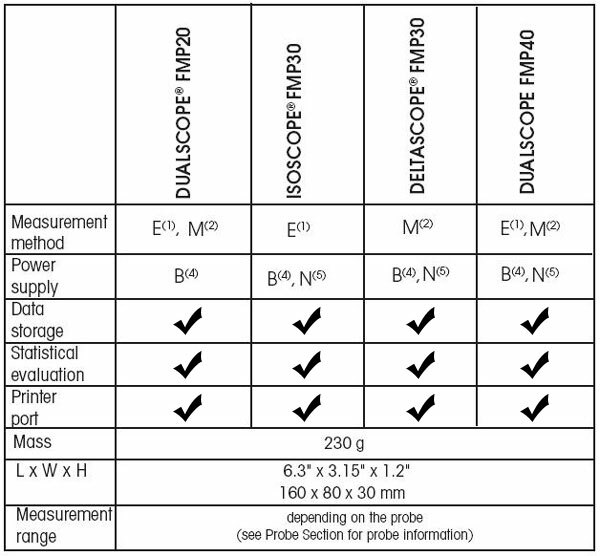 Depending on your measuring application, you can make precise coating thickness measurements according to the magnetic induction method (DELTASCOPE® FMP30), the eddy current method (ISOSCOPE® FMP30) or according to both methods combined in one instrument (DUALSCOPE® FMP40). You will be able to measure most standard or special applications with a wide assortment of Fischer plug-in type probes. Used for the measurement of paint, lacquer or plastic coatings on non-ferromagnetic metal substrate materials; used for anodic coatings on aluminium as well as electrically conducting coatings on non-conductive materials. 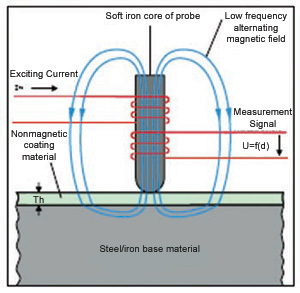 Due to automatic substrate material recognition and the combination of both measurement methods, this universal instrument is capable of measuring numerous coatings both on iron and steel, on non-ferromagnetic metals, and on non-conductive materials. Automatic base material recognition (FMP40). Note: All probes ±1% of measured value or ±.04 mils (1 Î¼m), whichever is greater. of the probe characteristic stored in the instrument. 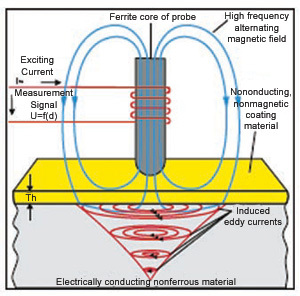 The excitation current of the probe enerates a high frequency primary magnetic field that induces eddy currents in the base material. Its secondary magnetic field weakens the primary field. This weakening effect corresponds to the distance (= coating thickness) between the probe and the base material and is converted to the coating thickness reading by means of the probe characteristic stored in the instrument.